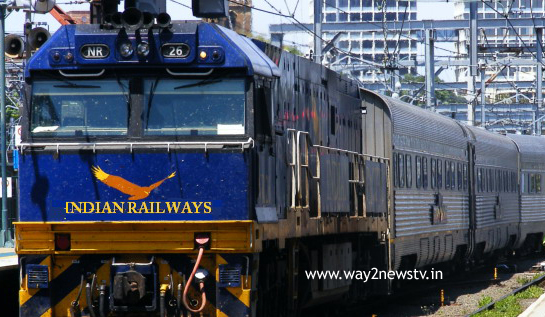 Home News RAILWAY SUPERINTENDENTS MEETING WITH MP'S............. ..
RAILWAY SUPERINTENDENTS MEETING WITH MP'S............. ..
Vijayawada, Jan 9 (way2newstv.in):Railway officials meet with AP MPs. The meeting is being held at Railway Training Center at Satyanaranayapuram in Vijayawada. TDP and VIPs MPs were present at the meeting headed by South Central Railway Minister Vinod Kumar Yadav. Pending rail projects in the state, new lines and trains are discussed. In the next few days, the Budget Documents will be finalized if the South Eastern Railway officials are meeting the Budget proposals. Vijayawada BRT The meeting was held with members of the Andhra Pradesh Parliament in the zone of the SS Railway. The meeting was attended by eight MPs from the Telugu Desam Party and four MPs from the Vice-Chancellor while the BJP MP, which was in power at the Center, was absent. Even though M. Pill, who attended the meeting, also heard the banners. Whether Vishakha Railway's proposal with all the forerunners ... Budget papers were unhappy with calling them and calling them. Some MPs, such as Rayapati, Kesineni, and Murali Mohan Anil Kumar, expressed their dissatisfaction with the meeting. Nani said he was coming to Betarani instead of meeting the pressure and said that the MPs had come to do a good boon with the Tamara Railway queue. Even though some members of the Parliament have expressed their dissatisfaction with the meeting, the MPs congratulated the Southern Railway officials. He said that once the Parliament was not counted, the present authorities said that they are fixing what they are saying in their future. At the meeting everyone explained the railway issues in their areas. All members of the Eluru parliamentary party, Maganti Babu, wanted to see all the trains in each district head quarters. The work done by Rayalaseema has been a bit worse, says DMK Reddy. The Kakinada MP, Mr Narasimha, said that Rs 200 crore has been allocated for the Kakinada Kodipalli railway works which connect Kostandhra. In addition, the NCP MLAs have expressed good views on the performance of the officers. Officials said all proposals submitted by the Parliament were given to the Railway Board. Most of the people believe that the members of Parliament should do whatever the Center says. Vishakha zone is in the hands of the Prime Minister. Whatever it was, the MPs had different backgrounds on this meeting.